Average Cruise Ship Cost - spoiler alert... it's a LOT! We’re often asked, “How much does a cruise ship cost to build?” These mega-vessels are so big and expensive, that they’re not purchased very often. As such, most people have no idea how expensive these things actually are. We’ve analyzed over 200 cruise ship purchases throughout the last few decades. This post will provide you with the most comprehensive analysis of cruise ship cost that exists anywhere. Trust us, we scoured the internet. Nowhere does anyone do justice to the question, until now. First, let’s go over a few items. It’s difficult to compare ships due to their differences in age, size, type, etc. A 400 person cruise ship purchased in 1985 and a 4,000 passenger ship bought in 2015 are going to have drastically different prices. Comparing the costs of each would be like comparing apples and oranges. To make the ships more comparable, we played with a few of these factors. Tonnage: a Cruise Ship’s “tonnage” describes the volume of that ship. It’s a standard unit of measurement used in the nautical world to compare the size of a ship. A larger ship will typically be more expensive than a smaller ship (obviously). 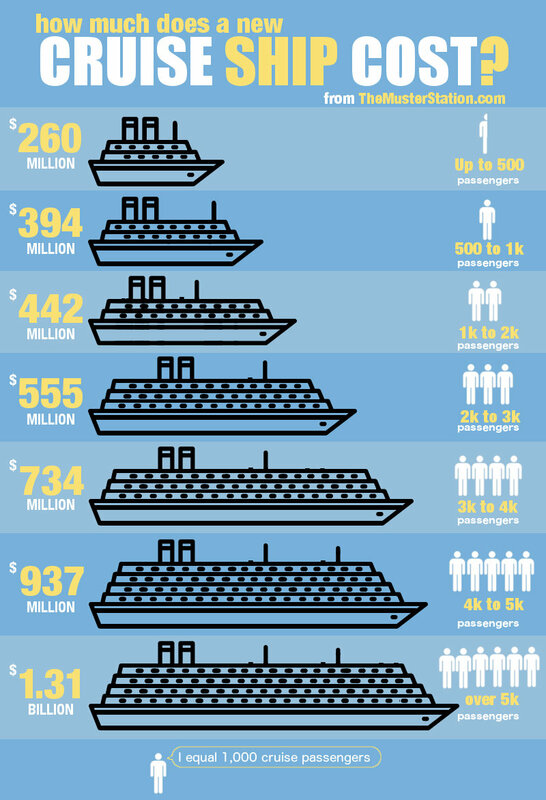 We included an infographic below comparing each cruise ship’s cost per gross tonnage. Cost: The price paid for the cruise ship at time of purchase. Cost Today: as mentioned above, this figure is the cruise ship’s cost in today’s dollars. We got to this number by applying the accepted CPI (consumer price index) as provided by the Bureau of Labor Statistics. By playing with a few of these, we’re pretty confident in our ability to compare cruise ship cost across all lines, sizes and years. Ok – now that the boring vocabulary lesson is done, let’s get to the fun stuff. 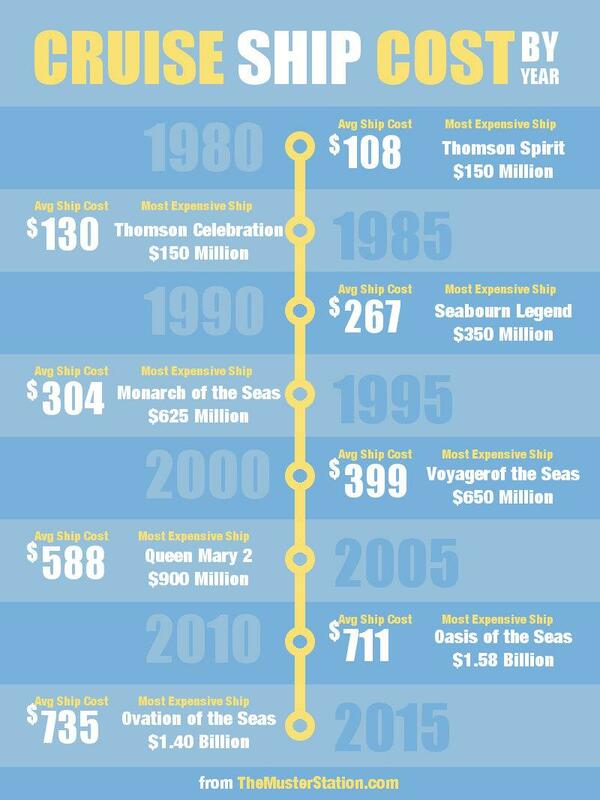 The graph below shows Cruise Ship Cost based on a ship’s capacity. It’s not surprising that ships that hold more passengers, cost more money. We’ve broken down the 200+ cruise ships into the following buckets. 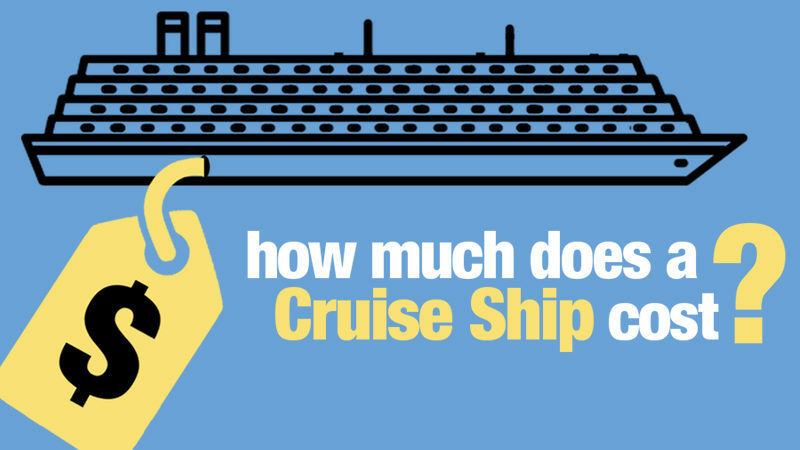 The figure on the left shows the average cost of a cruise ship within those capacity ranges. This number is the “Cost Today” figure mentioned above. We used this to account for the time difference between ships. Which cruise ship has the largest passenger capacity? The Harmony of the Seas has the largest maximum passenger capacity at 6,780. The ship also holds 2,300 crew members, for a total capacity of over 9,000! Which cruise ship costs the most? The “most expensive cruise ship” award goes to the Oasis of the Seas. It was built in 2009 for $1.4 billion! Six years later, the Ovation of the Seas was built at the same price of $1.4 billion. We gave the prize to The Oasis of the Seas because it was purchased a few years before the Ovation. If we apply the pricing index, the Oasis of the Seas “cost today” would be $1.58 billion! The prices shown are an average of the actual costs (not “today’s cost” as used above). Next, we were really curious of the following: Which cruise lines spend the most on their ships? In order to compare these hundreds of ships with varying ages and sizes, we had did the following. First, we used our pricing index to bring all ships to “today’s cost.” That allowed us to compare ships across all years. Next, we looked at cost by size. In order to compare ships across varying sizes, we used the standard measurement, tonnage. In doing so, that allowed us to look at which cruise lines spend more / less for their ships. The results were exactly as expected. The cruise lines catering to the masses (Carnival, Princess, Royal Caribbean, etc) spend less on ships. The high-end cruise lines, like Crystal, Seabourn, and RSSC spend much more. In our infographic, we broke up the ships into three buckets. Within the “Large Ships” bucket are the following cruise lines. 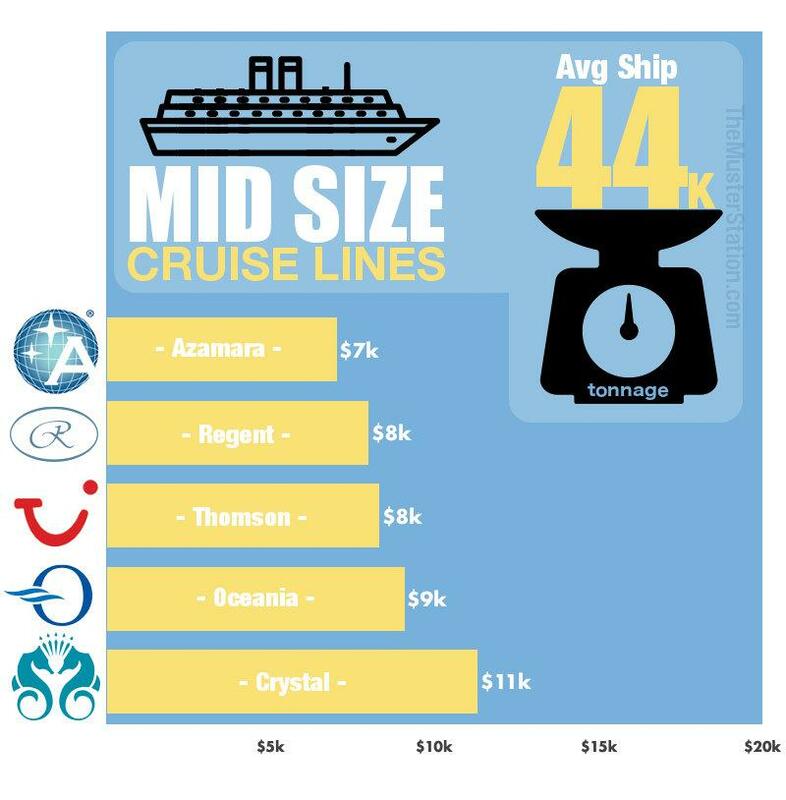 These cruise lines had an average ship size with gross tonnage of 97k. You can see that, of all of the large ship cruise lines, MSC spends the least on its vessels at $5,000 per gross tonnage. Costa spends 60% more per ship, or $8,000 per gross tonnage. These “mid-sized” ships have an average gross tonnage between 25k and 50k. Included in this group are the following. Cruise ship costs are significantly higher than the large ships, but not quite as expensive as the smaller vessels. These include ships with gross tonnage less than 25k. Among those are the following. 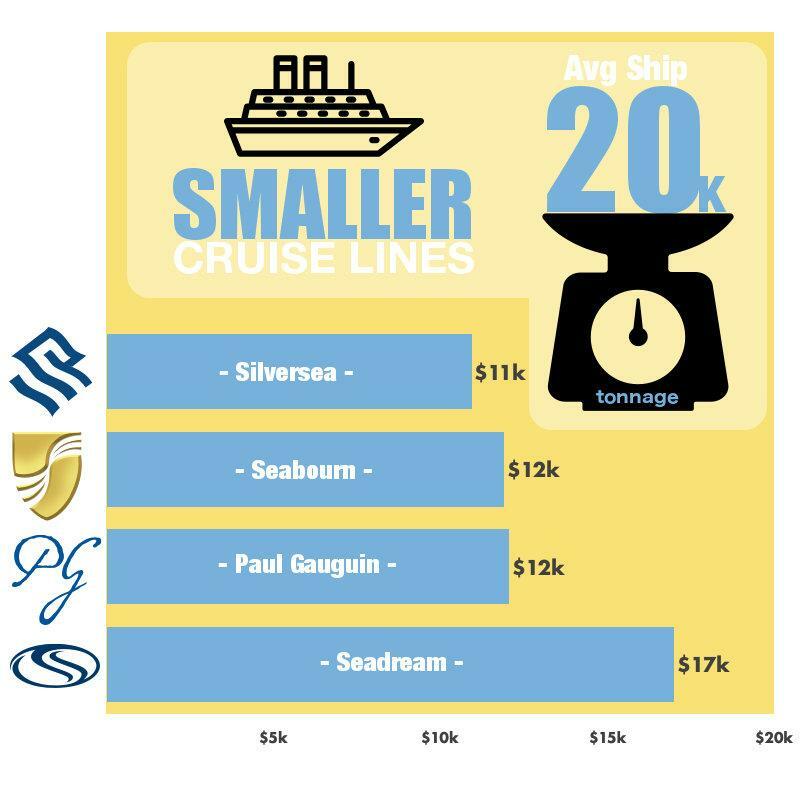 You can see that Seadream spends the most. Their cruise ships cost a whopping $17,000 per gross tonnage. That’s more than 3x of the average purchase price for MSC. 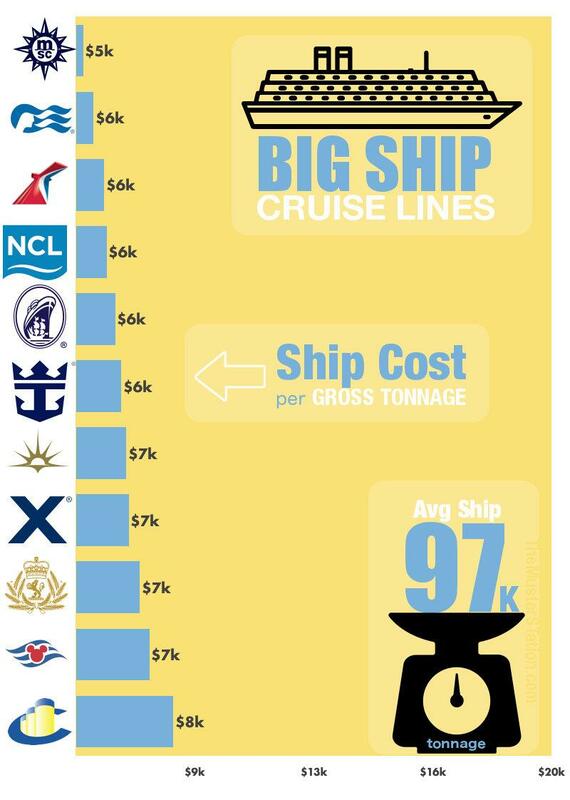 For the raw data, check out our raw, Cruise Ship Costs stats below. If you found this helpful, please share using the buttons below! You’re right, Scott – that’s fixed now. Thanks!